Dakota Invasion: The Summit League plans on joining the realignment-party beginning next season (2011-12) when Centenary will move down to Division-III, and the University of South Dakota will take their place. There has also been talks of adding an eleventh team, likely the University of North Dakota, joining the conference in the near future, which would mean FOUR teams from the Dakotas in the Summit. Good for rivalries, bad for the warm-blooded. An Oak In Oakland: The top teams in the conference made some key additions that fit nicely into their team philosophies. Oakland is happy to have Summit POY Keith Benson back, but they also added a center for the future: 7’0, 220-pound Kyle Sykora. The big man shot 71 percent from the field and blocked 5.6 shots per game during his high school years in Miami. It’s not often a seven-footer comes to the Summit League, and the addition of Sykora will assure Oakland of big-man dominance for years to come. 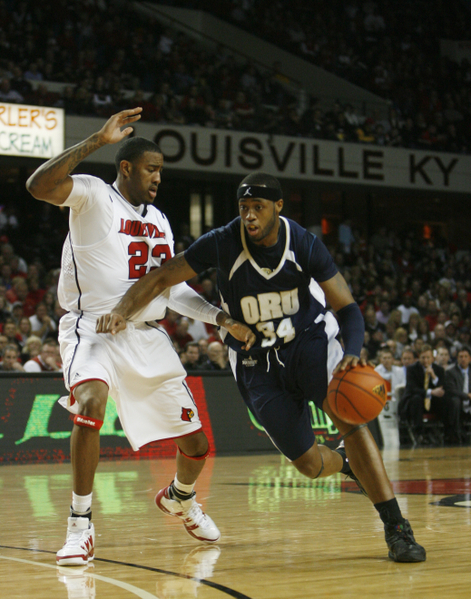 New Guard: IUPUI and Oral Roberts also added some nice guard pieces to their depth. P.J. Hubert (IUPUI) was an Associated Press honorable mention all-state selection in Indiana, and Jake Lliteras (ORU) was Player of the Year in the Carolina 9 conference. Both guys should have an immediate impact on the floor for two teams vying for a conference title. And last but not least, South Dakota made the most improvement when they picked up Rock Valley H.S. Stars Jordan Dykstra and Marcus Heemstra; both were given high grades by ESPN Insider. Oral Roberts – They lost one starter, and since they were a 20-win team last year (including victories over Stanford, #12 New Mexico, and Missouri) with only seven scholarship players healthy, the Golden Eagles have a golden opportunity ahead of them. They have won the conference title three of the past five seasons, and as long as Scott Sutton is still the head coach, this team will be one of the favorites. Known in the past for their strength at the guard position, ORU is especially strong there this year with five guards who have starting-five ability. Summit Newcomer of the Year Warren Niles leads the way. Oakland – Don’t sleep on the defending champs. Even though Oakland lost tournament MVP Derrick Nelson and the conference’s best guard, Jon Jones, the Golden Grizzlies return the Summit League POY Keith Benson and several key players from last year’s dominant squad that won 26 games, including 17 of 18 conference games. In a conference that only showcases three quality teams, Oakland has as good a chance as any to capture a second straight title, and they could replace ORU as the top team by the time the season starts, depending on how their recruits shape up. IUPUI – Last year, IUPUI surprised a few people with how competitive they were throughout the season, beating Oakland at home and dispatching ORU in the conference semifinals. IUPUI has recruited well, and they have one of the conference’s top scorers, Alex Young, returning for his junior year. The loss of Robert Glenn makes this team the third best team in the conference, but it’s a very close third. South Dakota State – SDSU cleaned house when it came to recruiting, and this class is their best chance to win a conference championship. Jordan Dykstra and Marcus Heemstra will make this team dangerous for the next four years, and if they don’t contend for a championship, it will be a big disappointment for SDSU. UMKC – Only recently has UMKC’s basketball program fallen upon hard times, and in the past they have been known for their physical-defensive play. Expect the ‘Roos to keep improving and return to their winning ways within a couple years. Their height will prevent them from beating the top teams in the conference, but they have good enough depth and experience to beat up on the rest of the conference. Head coach Matt Brown is fortunate to have his top three scorers returning in Jay Couisnard, Latreze Mushatt and high-flyer Trey McKinney-Jones. North Dakota State – One player stands between NDSU and mediocrity, and that’s Michael Tveidt. The senior is one of the best players in the league, but his team needs help. The Bison have the ability to shoot the lights out and claw to victory, but most nights, they shoot two bricks short of a mansion and their defense can’t sustain them. Bottom line, if their shots are on, Tveidt is good enough to be the difference in the game. If they’re off, it’s game over. Saul Philips will have to improve his defense if they want to be a contender. IPFW – The Mastodons had a decent season, going 9-9 in conference play. Ben Botts is returning as one of the elite point guards in the conference, but where will he get his help? IPFW lost their leading scorer, and they will need someone unknown to step up. They are hoping their seven-foot transfer center Terrance Williams will be that guy. Southern Utah – Roger Reid has experienced plenty of coaching success in the past (leading BYU from 1989-97, and as a Phoenix Suns assistant from 1998-2003), but he has his work cut out for him with this Southern Utah team. In his third year, a 7-22 record is almost bad enough to put Reid on the hot seat. The T-birds are hoping the addition of juco transfer Ramell Taylor will be enough to at least get them ten wins. Baby steps. Western Illinois – This was an awful team last year, and they haven’t taken any significant measures to step up. Relying solely on Ceola Clark, the defensive POY, Western hasn’t improved much, and they lost a decent guard in David Nurse last year. Nurse was a vital part to this team, and they haven’t adequately replaced him. I expect Western to take step back… if that’s possible. Centenary – The Gents are a terrible team, however, they are one of my favorite cellar-dwellers because they fight hard every game. They just can’t compete, even with the mid-majors. They will be ineligible for postseason play because of their upcoming demotion to D-III, so whatever fight is left in them may vanish without the hope of making the tournament. Poor Centenary, may you find victory—in D-III. It will be interesting to see if there is any more progress made in the realignment. If there is, I suspect adding North Dakota will be the topic of discussion. If they decide to add UND, will another team be removed? It’s doubtful that a team like ORU makes a leap to a more competitive conference should one come calling, but possible. Oral Roberts was the only team that battled major injuries last year. It will be interesting to see how those players bounce back. Guards Rod Pearson, Hunter McClintock, and Forward Tim Morton all had season-ending knee injuries last year. How they respond may decide the conference championship. This entry was posted on Thursday, August 5th, 2010 at 4:12 pm by Brian Goodman	and is filed under summer school. Tagged: centenary, ipfw, iupui, Jake Lliteras, north dakota, oakland, oral roberts, south dakota st, southern utah, summit league, umkc, western illinois. You can follow any responses to this entry through the RSS 2.0 feed. You can leave a response, or trackback from your own site. I don’t think coach Brown is very fortunate, both Mushatt and McKinney-Jones both UMKC in April.